The Japanese angelica tree (Aralia elata) is a small deciduous tree that bears clusters of cream-colored blossoms during summertime. The sprouts are cooked and eaten in some Asian cuisines like Japanese and Korean. It has been granted the Award of Garden Merit by the Royal Horticultural Society. In the United States, it is known to be invasive in some areas. The name given to this species is Aralia elata and it belongs to the Araliaceae (aralia or ivy) family. Examples of other family members include the devil's walking stick ( Aralia spinosa), Japanese aralia (Fatsia japonica), ivy plants (Hedera spp. ), ginseng (Panax spp.) and the umbrella tree (Schefflera arboricola). This tree grows best in Zones 4 to 8. It may be able to tolerate conditions in Zone 3 within some regions if it is placed in a sheltered location. Aralia elata can be either a large shrub or small tree. At maturity, it can be 12' to 40' tall and 6' to 30' wide. It has an irregular shape. Full sun to partial shade is tolerated by the Japanese angelica tree. This tree bears foliage that is bipinnate, where the true leaf is made up of leaflets. Each leaflet is itself made up of little leaflets. The leaves can be either red or yellow in the fall. Bees will come to visit the clusters (called panicles) of white flowers that come in summer. They are followed by purplish-black drupes that are a favorite food for birds. Look for 'Silver Umbrellas', ‘Aureovariegata’, 'Golden Umbrella' or 'Variegata' if you prefer foliage with a variegated appearance. Aralia elata is considered to be invasive in some regions since it spreads through seeds dropped by birds and clones itself, so check with your local nursery or extension service before you plant this. The trunk and branches are covered with prickly bark. This trait can be used to your advantage if you are trying to keep people and animals out of a certain area. Aralia elata grows well in urban locations since it can handle pollution and various pH levels and soil types. It is a fast-growing tree that can help populate an area quickly if needed. You can reproduce the angelica tree by planting the seeds, dividing the suckers or taking cuttings. Grafting is necessary for named cultivars or the desired characteristics will not be found in the resulting tree. The Japanese angelica tree will not need yearly pruning unless parts have become dead, diseased or damaged. You may have to watch for any suckers and remove them to help keep the tree from cloning itself and spreading. 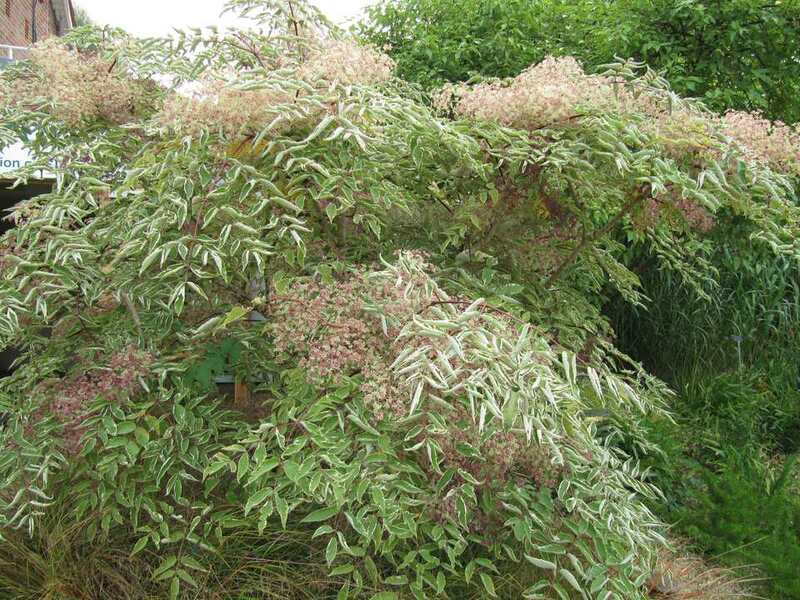 There are no serious disease problems associated with Aralia elata. You may see some leaf spots, but they are generally not too harmful.